Secular stagnation is a term to describe the advanced economies with a long-term downtrend of the economic growth and the inflation rate. 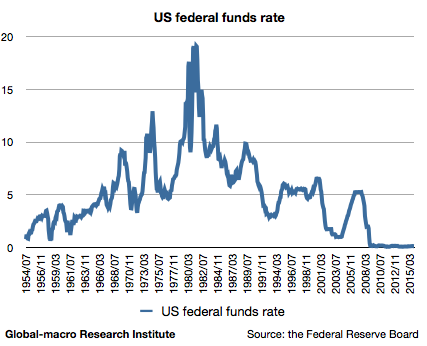 In the reality, the deflationary force is obviously seen in the long-term chart of the federal funds rates. The issue is that these factors they suggest are highly structural or long-term cyclical, which would be difficult to overcome. On the other hand, the central bankers such as Ben Bernanke asset that the downtrend is due to temporary causes such as the weak Chinese yuan absorbing money from overseas. However, this is only true if the yuan is undervalued, but investors are now worried about the further necessity of devaluation of the Chinese currency. Secular stagnation is now a very trendy word in the hedge fund industry. Whereas the central bankers can remain comfortable ignoring all the negative factors in the economy, hedge fund managers, with their own money at risk, are more serious about the deflationary force. George Soros is probably the most famous investor who is bearish on the US economy. In the interview with Bloomberg in Davos, during the World Economic Forum, he expressed his pessimistic opinion on the US economy. He mentioned the deflationary risk, asserting, “deflationary expectations had already set in and consumers were less likely to respond to lower borrowing costs with increased spending”. He also disclosed that he was shorting S&P 500 and buying Treasury notes, both of which are positions supported by a negative outlook for the US economy. Secular stagnation is not merely negative on the economy but also quite decisive on whether the Fed can successfully raise interest rates. Mr Summers himself has been insisting, “it was not a confident bet that the economy could withstand four rate increases this year” (CNBC), and agreed to the recent market moves that reflect investors’ pessimistic view on the Fed’s hawkishness. Ray Dalio, who manages Bridgewater, the world’s biggest hedge fund, is more radical on this issue. In the interview with Bloomberg, he said, “the Fed could raise interest rates by another 25 basis points, but such a move would be a serious mistake”, and “the next big move I believe will have to be toward quantitative easing, rather than a big tightening”. Mr Dalio especially emphasizes the effect of the long-term debt cycle in secular stagnation. In his theory, the advanced economies have been growing depending on the unsustainable expansion of the private and public debt, although we are coming to the end of the cycle as there is no further room for easing as we are in the liquidity trap. As the growth has been supported by continual rate cuts, we will not have any growth because we do not have rates we can cut further. So, then how can the global economy survive the secular stagnation? Different people recommend different policies. Mr Summers suggests fiscal stimulus. He points out that very low interest rates are the very good opportunity to borrow money and invest, mentioning that there is huge room in the US for public investment. “Has there ever been a better moment to fix LaGuardia or Kennedy Airport? It is crazy that at a moment like this”. On the other hand, Bill Gross, the manager at Janus Capital known as the “Bond King”, advocates neither of them would function well. In the Twitter account of Janus Capital, he emphasizes the risk of an asset bubble, suggesting that the recent appreciation of global bonds are actually at risk of a bubble, and both of helicopter money and fiscal spending are negative for it. He claims that deflation is better than reflation. He said, “reflation vs. stagnation/deflation, that is the question. Whether to take or not take risk is the strategy. The latter is my choice”. Mr Summers also admits that an asset bubble would be unavoidable to have a decent growth under secular stagnation. The economy is now at the dead end. The economy seems to have nowhere decent to go, but even in this situation investors still have somewhere to go: gold. When we cannot buy any asset, and when we cannot even trust any currency, something that is neither a currency nor affected by the weak physical demand in the economy will prevail. In inflation, in deflation and even in secular stagnation, investors have their own way.